The Goldbergs looked the same and sounded the same in last night’s season 3 premiere, but with a delicious twist. This sitcom, with all its 1980-something brilliance, is evolving with its visibly older looking and sounding Adam. While this development did not equate to anything dramatic for this series, it did raise the bar a little for Adam and Dana, who are now treading into comparisons with Kevin and Winnie of The Wonder Years because of their relentless correspondence between Philadelphia and Seattle. As the season 2 finale and the season 3 premiere revealed, Adam and Dana’s affection for one another is real (enough) for it to be a series-long relationship. Only the real Adam F. Goldberg knows the answers to all these questions, along with his hilarious family and friends. So, we’ll just have to wait. How many minutes until next week’s episode? It would be an understatement to say the ’80s classic, Risky Business, was the over-arching theme last night. Barry slid, crashed and tripped into some good “old time rock and roll” before Beverly stopped his “Tom Cruisin'” in purple spandex, while Erica and Lainey decided to drive right into their “Risky Business” party with the Porsche left in the garage by Lainey’s father. The joy ride was going great, including Barry’s perfect Rebecca De Mornay exclamation. And then, it was Goldbergs time. Let’s just say Barry’s leg falling asleep was a disaster for a stick shift, Beverly added a daughter in Lainey (extra cheese, class preferences, head cheerleader and tutoring, anyone?) and Murray exercised his unbeatable prowess of saying no for Adam’s long-distance phone calls to Dana. However, Beverly finally became too Beverly for Lainey. End result? The cancelled “Risky Business” party was back on! The only problem was it turned into something way too risky, even for Big Tasty. The stolen TV and spinning pizza was only the beginning of a rough night for the terrified trio. And to answer your question: Yes, Big Tasty dropped a fresh rhyme last night in the form of a music video. He even had a new sidekick, for whom he helped write the song for. It was Big Tasty and Lil’ Yum Yum/Adam! Run DMC would have been proud…of their clothes. As the party raged out-of-control, there was only one person who would randomly show up to save the day, but only with the greatest of all snuggies first. Beverly heroically came to the rescue of her 3 2 children and she got everybody to leave with (you didn’t guess it) her killer dance moves. She was going Cruisin’. Today, it would have been tagged #momdance #bigsocks and #riskygymnast. And then there was Pops, who again shared his sage advice with son-in-law Murray. After Pops reminded Murray’s of his only successful long-distance relationship, that not only made him realize the power of love (random ’80s reference = self-high five! ), but it brought him closer to his youngest son. When we fall in love, we fight for it. Everything else is blurry. Nothing else matters. Love is the best, yet strangest feeling of them all. It requires faith and a fearlessness within ourselves. As we enter season 3, The Goldbergs continues to be fearless with unapologetic heart. Hopefully, you were able to read all of this in less than 10-minutes. Put on a Dolphin Sweater, it’s Snuggie Season! Roads…where we’re going, we don’t need roads, a buffing machine or even pants. 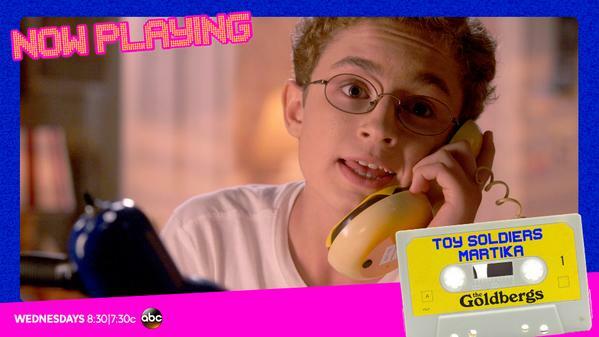 Let’s get right to it: The Goldbergs returns to our lives with its season 3 premiere tonight at 8:30 p.m. on ABC. The ’80s are back in business and it looks riskier and funnier than ever! Robert Lewandowski did the impossible. A display of pure brilliance from a Bundesliga match earlier today between Bayern Munich and Wolfsburg is going to seem unreal, utterly fanciful. Soccer is the beautiful game and there have been countless goals, braces and hat-tricks throughout its extensive history that warrant great fanfare. Some of these moments define players forever. Forwards (for instance) cannot score off of every touch, pass or shot. That just doesn’t happen. Or, that never used to happen. For any striker, patience combined with relentless effort and vision is what creates opportunities to score and celebrate in style. Watch the entire video and pay close attention to Bayern Munich player Robert Lewandowski (#9 in red), his total goal tally AND the time frame of the goals. Oh, and he was a substitute at the beginning of the second half. Love and Mercy, the tragic and revealing story of musical genius Brian Wilson of The Beach Boys, proved to be the ideal title for this shocking true story. Without diving into the details and spoiling anything, it’s a movie that emotes joy, anger, sadness and surprise. The underrated Paul Dano portrays Brian Wilson as he’s writing and making music with The Beach Boys in strange, unorthodox fashion as they created one of music’s greatest albums (“Pet Sounds”) and the always down-to-earth John Cusack plays the delicately charming and haunted adult Brian Wilson during the late 1980s. Impressively, Cusack and Dano escaped into Brian Wilson so well that they projected one complete character throughout the film with seemingly identical mannerisms, tendencies and personality. And Elizabeth Banks (Melinda Ledbetter) and Paul Giamatti (Dr. Eugene Landy) were terrific in their roles. For the casual fan of The Beach Boys, it was known that they were not all sunshine and fun. Love and Mercy reveals some of that raw tension during their prime in 1960s southern California. However, there were moments of wonderful collaboration that resulted in unmistakably great music. In keeping with that spirit of showcasing this band’s immense talents, here’s a Beach Boys promotional video from 1966. Here’s to Some Good Vibrations This Week!